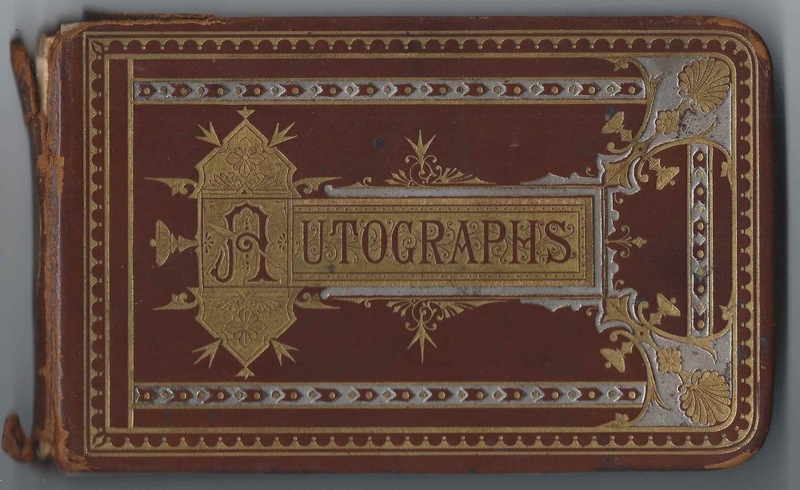 1878-1883 autograph album of Mary Ellen Griswold, "Ella", of Kinsman, Ohio. The autographs were collected before and after Ella's marriage to George William Birrell. The album is approximately 7" x 4-1/4" and contains the sentiments of 44 of Ella's relatives and friends. An alphabetical list of the signers appears at the end of this post. 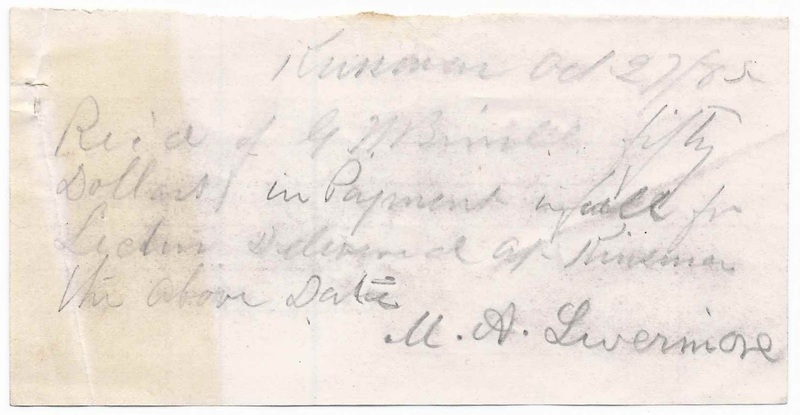 The album also includes two items associated with women's suffragist Mary Ashton (Rice) Livermore: a receipt that she signed as having been paid $50 in full for an 1885 lecture at Kinsman, Ohio; and a short newspaper clipping of her death in 1905. The clipping mentions that Mary had been a candidate for U.S. president on a woman's suffrage platform. Mary Ellen Griswold was born 30 January 1859 at Gustavus, Ohio, the daughter of George Absalom Griswold and Mary Augusta (Sperry) Griswold, who were both Connecticut natives. 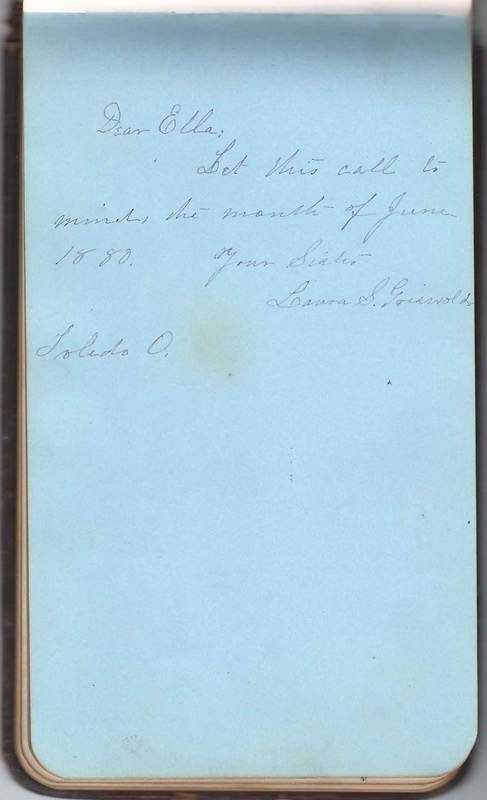 Laura S. Griswold signed a page at Toledo, Ohio, in June 1880 and called herself Ella's sister. She was actually Ella's sister-in-law, Laura (Shelby) Griswold, husband of Ella's older brother George H. Griswold. Two of Ella's father's sisters signed pages in her album. One was Ellen Frances (Griswold) Strieby, who signed a page at Kinsman, Ohio, on June 29, 1883. The other was Adeline Cornelia (Griswold) Walker of Monroe City, Missouri, who signed a page at Kinsman, Ohio, on July 4, 1883. She noted that she was then 73 years old. The R. M. Walker of Monroe City, Missouri, who signed a page on June 29, 1883, was presumably Adeline's husband Ralph Manning Walker. For the names of other relatives who signed pages in the album, refer to the list of signers below. On 25 November 1880 in Trumbull County, Ohio, Mary Ellen Griswold married George William Birrell, son of George and Nancy Birrell according to "A Twentieth Century History of Trumbull County, Ohio", source of the link preceding, or son of Henry and Agnes (Bonthrone) Birrell, as mentioned in various online trees. George William Birrell was born 7 May 1845 at Kinsman, Ohio. 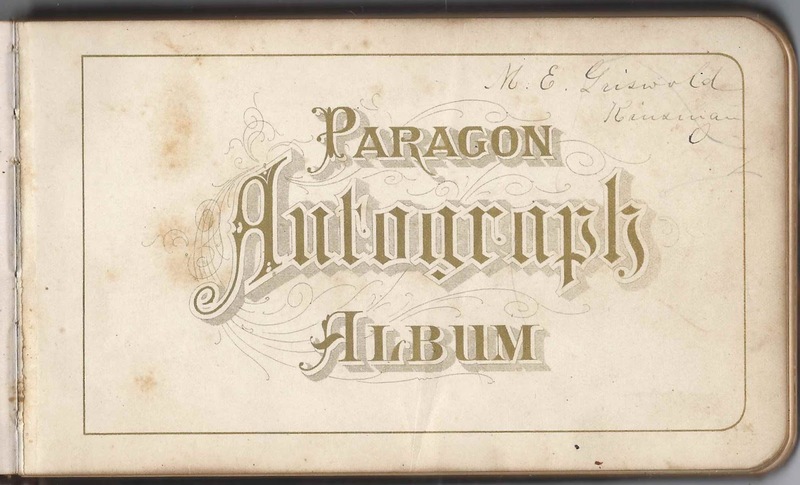 He signed a page in Ella's album at Kinsman, Ohio, on March 11, 1881. Ella and George would have three children before George's death in 1907. Ella lived until 1928. 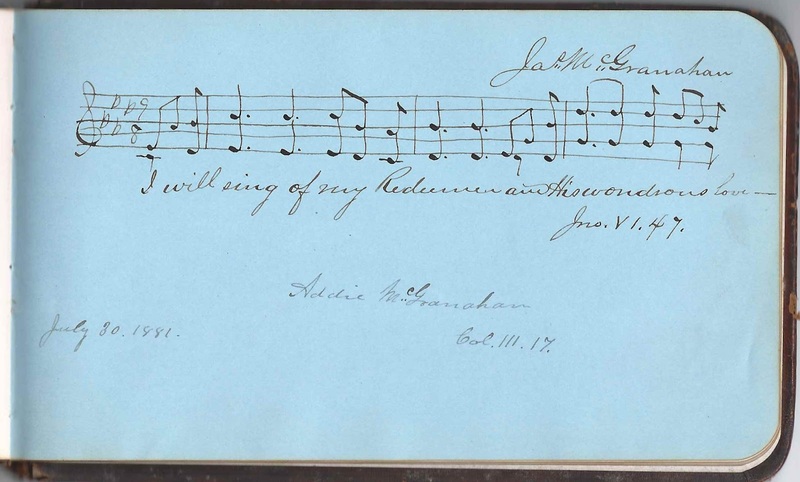 The last two pages in the album were signed by James McGranahan and Charles Clinton Case, noted musicians and composers who lived in the Kinsman, Ohio area. 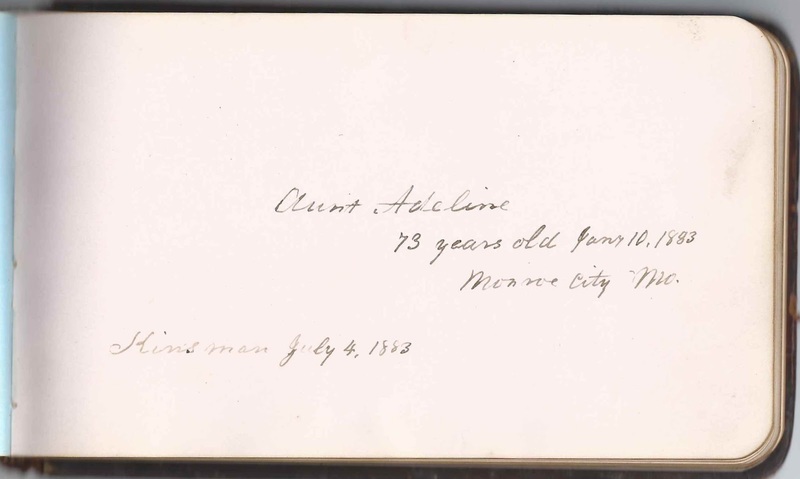 James McGranahan and his wife Addie signed a page on July 30, 1881. Charles Clinton Case and his wife Annie W. Case signed a page on July 17, 1880. 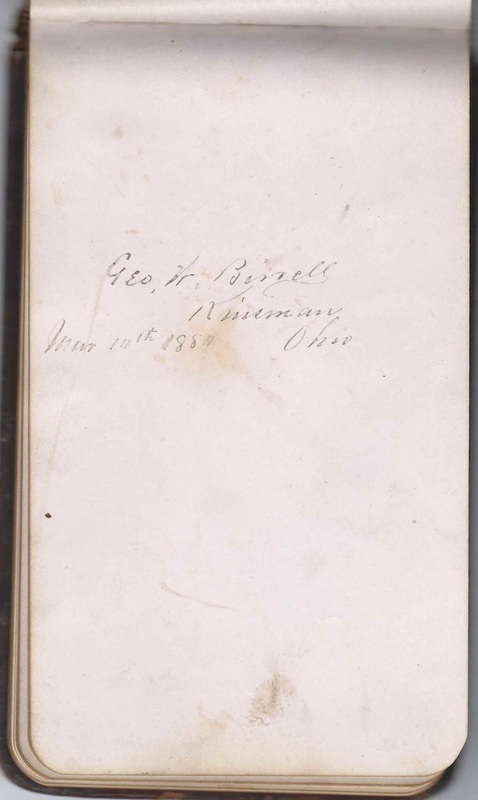 George W. Birrell of Kinsman, Ohio, signed on March 11, 1881. Presumably Ella's future husband or his father. 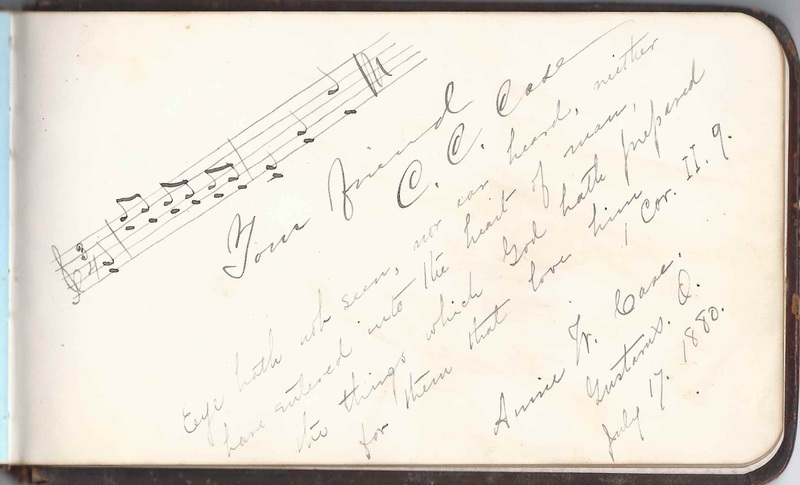 Annie W. Case, signed on July 17, 1880, on a page shared with her husband Charles Clinton Case. Laura S. Griswold, signed in June 1880 at Toledo, Ohio; called herself Ella's sister, but she was actually her sister-in-law. She was Laura (Shelby) Griswold, wife of Ella's brother George H. Griswold. Catherine Griswold of Poquonock, Hartford, Connecticut; middle initial is S or L.
Clara B. King, signed at Kinsman, Ohio, on August 22, 1880; "one of your S. S. girls"
Addie McGranahan, signed on July 30, 1881. Her husband, composer and music educator James McGranahan shared the page. Bertha L. Melvin, signed on July 6, 1880. She shared the page with James Melvin, her father. Her mother Minnie E. Melvin signed the following page. James Melvin, signed on July 6, 1880. He shared the page with his daughter Bertha Melvin. His wife Minnie E. Melvin signed the following page. Minnie E. (Yates) Melvin of Toledo, Ohio; her husband James and their daughter Bertha signed the previous page. Henry M. Strieby of Newark, New Jersey, signed at Kinsman, Ohio, on November 2, 1878. He was Henry Martin Strieby, son of Michael Epaphroditus Strieby and Ellen Frances (Griswold) Strieby, who was a sister to Ella's father George Absalom Griswold. 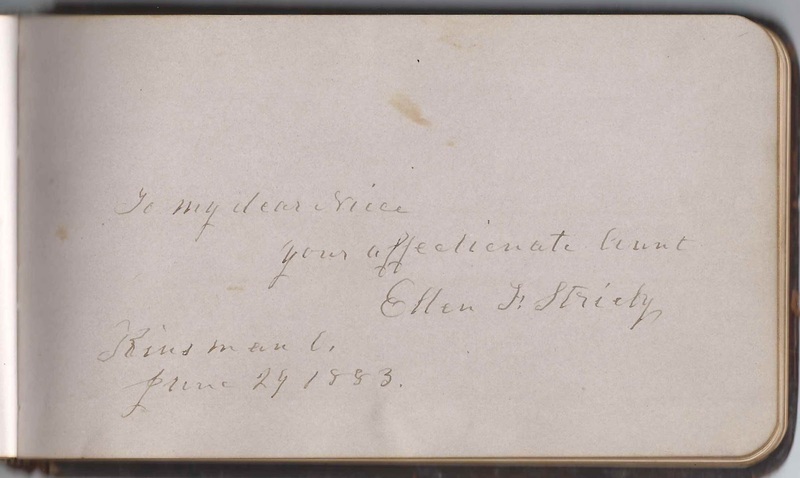 Ellen F. Strieby, signed at Kinsman, Ohio, on June 29, 1883; Ella's aunt. She was Ellen Frances (Griswold) Strieby, a sister to Ella's father George Absalom Griswold. Edward D. Vance; his wife Annie Kellogg (Hammond) Vance signed the right facing page. He was a Presbyterian minister at Kinsman, Ohio. Annie K. Vance, signed at Kinsman, Ohio, on March 6, 1880; her husband Rev. Edward D. Vance signed the left facing page. She was Annie Kellogg (Hammond) Vance. 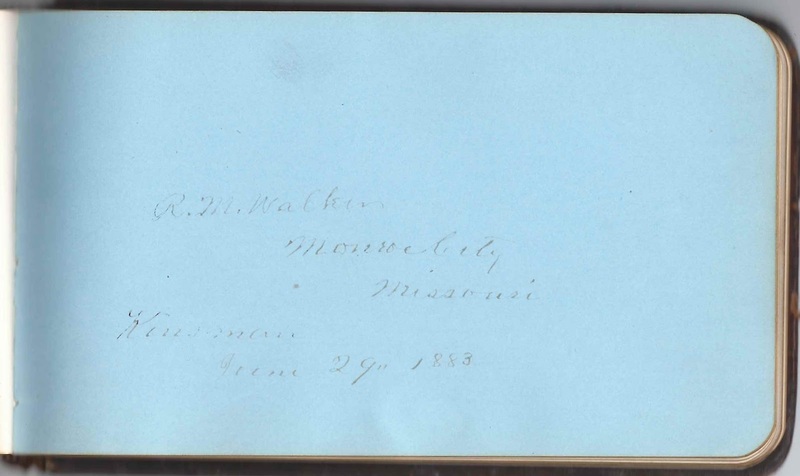 R. M. Walker of Monroe City, Missouri, signed at Kinsman, Ohio, on June 29, 1883. Presumably Ralph Manning Walker, husband to Adeline Cornelia (Griswold) Walker, who signed the following page. She was Ella's paternal aunt. Aunt Adeline of Monroe City, Missouri, signed at Kinsman, Ohio, on July 4, 1883; Ella's aunt. "73 years old January 10, 1883". She was Adeline Cornelia (Griswold) Walker, sister of Ella's father George Absalom Griswold. They are probably related to the man who founded Griswold Mfg. in Erie, PA. Wikipedia says he was born in East Lyme, Ct. But I can't find a tree that ties them together. Kinsman Ohio isn't far from the PA line. My father sold corrugated boxes to Griswold in the 1950's and 60's and we had the best set of cast iron pans in the neighborhood - samples so he could design the boxes to ship them in. Thanks, Ed - so neat to think of a connection with Griswold cast iron pans and, further, to your family! I've never bought a Griswold with a nice Hamilton cardboard box, though - mine have come from auctions and antique shops.